Here’s a twist on labeling issues — sparkling wines masquerading as champagne. 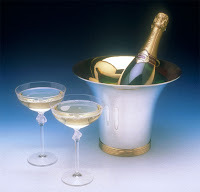 “In December 2006, Congress passed legislation banning the future misuse of 16 wine place names, including Champagne. While that was a step in the right direction, the legislation did not address the grandfathering of labels currently misusing Champagne’s name and that of 15 other international wine regions,” the Office of Champagne explains in their official press release. As a supporter of stricter regulations on food labeling, I empathize. My most pressing food labeling issue? Trans fats. Gets the message across more clearly, don’t you think? This is especially frustrating when you consider that most people won’t just eat a minuscule supposed “serving.” In the end, I much prefer Europe’s calorie/nutritional labeling = per 100g, with a “whole package” column next to it if it’s something like a yogurt cup or a bar of chocolate (unlike in the US, where I see a tiny candy or cookie sneakily divided into 2 servings). Then again, showing nutrition per 100g may force people to undertake some math calculations… what horror! Common vegetable oils like Canola, Corn, and Soybean all go through a 'deodorization process' that converts 2-4% of the oil to a trans fat. This is not 'partial hydrogenation', a completely different process. Because a serving is 14g, these oils will be labeled as 'zero trans fat' oils even though they may be up to 3.5% trans fat. So you may avoid all 'partially hydrogenated' products, and only eat processed foods that don't include 'partially hydrogenated' oils, and still consume 3-5g of trans fats every day from these deodorized vegetable oils – and they're all deodorized. It's a travesty. Deodorization does result in the formation of some trans fats. This varies from oil to oil, though. An oil that is deodorized at 400 degrees Fahrenheit, for example, produces almost no trans fats (whereas an oil deodorized at 520 degrees can provide the 3% figure you mention). This is why, when it comes to vegetable fats, dietary recommendations are to eat whole foods (ie: actual nuts and seeds, rather than heavily refined oils).